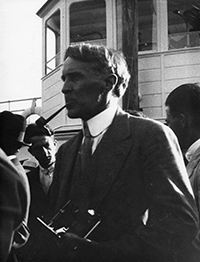 Patrick M. S. Blackett was a particle physicist at Victoria University, Manchester, United Kingdom. He was awarded the 1948 Nobel Prize in Physics "for his development of the Wilson cloud chamber method, and his discoveries therewith in the fields of nuclear physics and cosmic radiation." November 18, 1897Birth, London (England). 1910 – 1914Cadet, Royal Naval College Dartmouth. 1921Obtained First class honours degree in physics, Cambridge University, Cambridge (England). 1921 – 1923Research student, Cavendish Laboratory, Cambridge (England). 1923Fellow, King's College, London (England). 1924 – 1925Visiting Fellow, Universität Göttingen. 1933 – 1937Professor of Physics, Birkbeck College, University of London. 1934 – 1939Member, Committee for the Scientific Survey of Air Defence (the Tizard Committee). 1934 – 1970Chief Scientific Adviser, Great Britain Ministry of Technology. 1934 – 1970Deputy Chairman, Advisory Council on Technology. 1937 – 1953Langworthy Professor of Physics, University of Manchester, Manchester (England). 1939 – 1940Principal Scientific Officer, Royal Aircraft Establishment. 1940Awarded Royal Medal, Royal Society. 1941 – 1942Head of Operational Research Section, Great Britain Royal Air Force. 1948Wrote "Military and Political Consequences of Atomic Energy". 1949 – 1964Member, National Research and Development Corporation. 1953 – 1967Professor of Physics and Head of Physics Department (1953), Imperial College, University of London, London (England). January 27, 1969Made Life Peer (Baron Blackett). July 13, 1974Death, London (England). Advised by Blackett at University of Cambridge. Advised by Blackett at University of Manchester. Postdoctoral advisor at Universitat Gottingen. Postdoctorally advised by Blackett at Birkbeck, University of Manchester. Postdoctorally advised by Blackett at University of Cambridge. PhD advisor at University of Cambridge. Collaborated on the MAUD Committee, lead by Thomson. Head, Operational Research Section, Coastal Command. Professor of Physics and Head, Physics Department. Fellow and awarded 1940 Royal Medal. Obtained First class honours degree in Physics (1921). Patrick Stuart, Baron Blackett, papers, 1911-1975. Arthur Holly Compton papers, 1905-1971. C. P. Snow collection, 1931-1980. Frank Watson Dyson papers, 1875-1950. Lord Blackett Physics Today obituary. Oral history interview with Dennis William Sciama, 1999 June 9. Oral history interview with Otto Robert Frisch, 1967 May 3. Oral history interview with Sir Bernard Lovell, 1971 July 6. Atomic weapons and East-West relations. Cosmic rays; being the Halley lecture delivered on 5 June 1936, by P. M. S. Blackett. Fear, war and the bomb: military and political consequences of atomic energy. La radiation cosmique, par P. M. S. Blackett. Military and political consequences of atomic energy. A lesson for the future of our science: my testimony on Lord Patrick M.S. Blackett/ Antonino Zichichi, European Physical Society, Switzerland. Blackett : physics, war, and politics in the twentieth century / Mary Jo Nye. P.M.S. Blackett: a biographical memoir / by Sir Bernard Lovell. Patrick Blackett: sailor, scientist, and socialist/ edited by Peter Hore; with a foreword by Tam Dalyell. Patrick M.S. Blackett Nobel Prize biography. Report on correspondence and papers of Patrick Maynard Stuart Blackett, Baron Blackett (1897-1974), nuclear physicist, 1920-1974 / [compiled by Jeannine Alton, Harriot Weiskittel, Julia Latham-Jackson].